Lately I've been having a bit of a love affair with French décor. 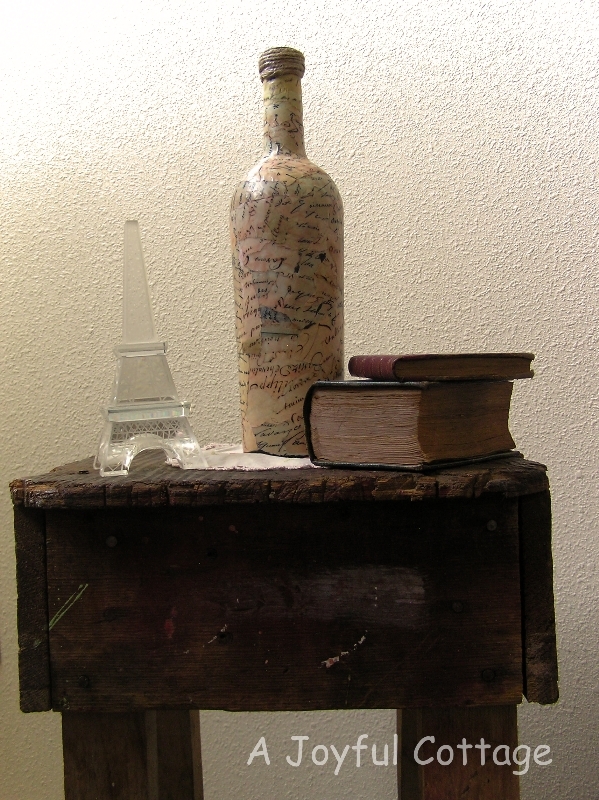 It all started with the French script bottle I created and blogged about. No, wait. I have to go back farther to my post on bedrooms featuring toile. 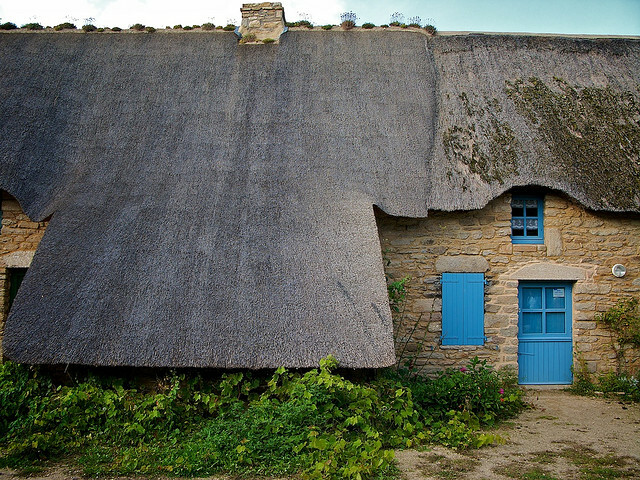 And, come to think of it, maybe it's actually not all that recent -- my love affair, I mean -- as I did blog about French cottages over a year ago. The subject came from a photo by Jamie in Toulouse, France. 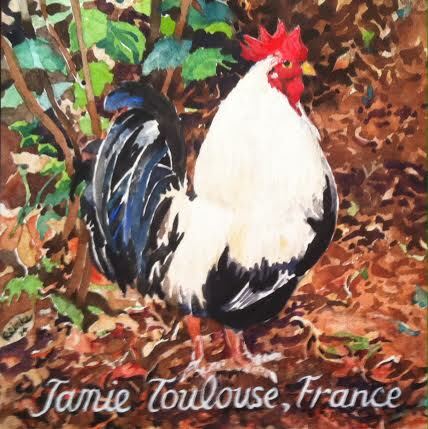 . .
Jamie captured the rooster perfectly, and we want to honor him and his work. Thus, the inscription on the painting. Now here's a question for you, dear friends. What sort of décor are you attracted to these days? How funny you should ask this question, Nancy. I've been thinking about this lately. I have always decorated in a shabby chic style, adding more ruffles, and roses for a more romantic look the past couple of years....but since summer, I've been adding more and more French pieces. My late husband's mother is from France, so I've always had a few items in the house(silverware, dishes, religious items) from trips to Paris, Deauville, and Vaurielle. I now have added French style furniture, chandeliers, mirrors, clocks, etc. I'm not sure why I'm leaning toward a shabby French look....maybe it's because I'm ADD, and it's just another chapter in my book, "Debbie's Ever Evolving Decor"???....hmmmmm. Ooh, I am jealous! Custom artwork on demand? You are a lucky, lucky lady! 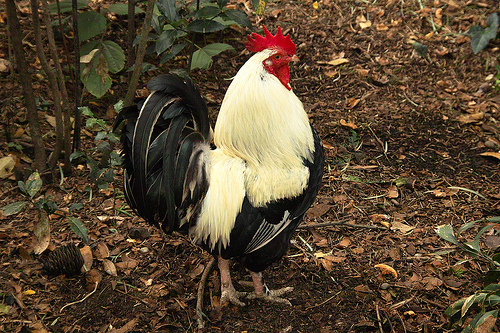 I love roosters, have a bunch of them in my kitchen, although none quite as lovely as yours! The colors are stunning. Lately, I find myself drawn to light colors and a bit more feminine décor. Maybe it's spring...maybe not, either way, it's a hard pull to ignore! Ps- thanks for your nice comment on Parade. That was sweet of you to take the time to comment! P.S. Regarding the Parade comment, you're welcome. It's a great article. You do good work. Hugs. Hi Diana. Dennis shows in galleries, and he also has an online web site: http://www.dennisreinke.com. 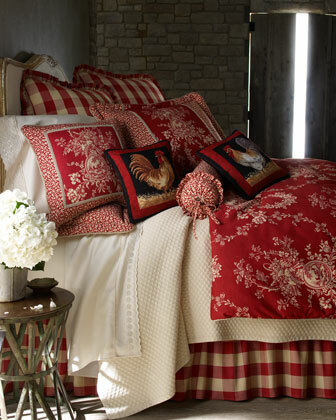 Oh my, I am in LOVE with the red toile bed! Gorgeous! The painting is wonderful. Your husband is very talented! As for my decorating style? Well....... as I get older I am getting more traditional and minimal at the same time. I am really starting to get tired of constantly having to dust my stuff. 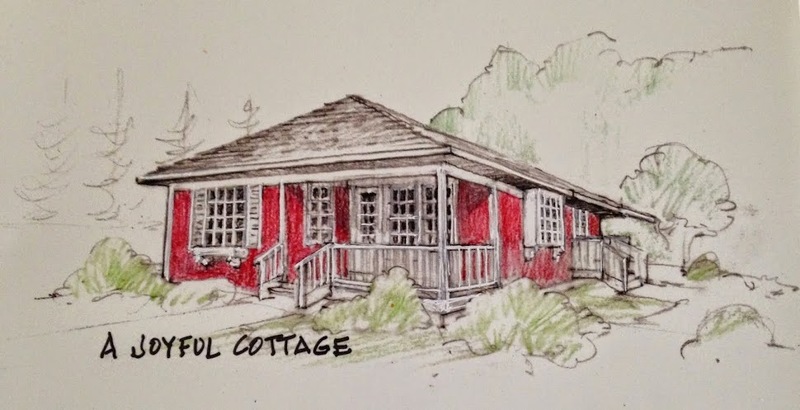 Of course, there are pieces that I will never part with, but as hubby and I are going to be selling our home soon (we are listing in a couple of weeks) and building on our future homestead (finally) we want to pare down all of our "stuff" and only keep what we really love. What a fabulous painting - Nancy your husband is so talented! I'm off to see what else he's sharing on his website. I have several French furniture pieces - antique and repro - all are painted by me or friends! On trips to the 'beautiful country' - my brother and family live there - I have bought lots of French accessories, old books and vintage linens. I mix these with English china and pieces belonging to my mother and grandmother which were passed down to me. Have Italian chandeliers from antiques shops, and I love American farmhouse - especially white ironstone tureens, items bought mainly in Asheville, NC (great shopping for antiques and collectibles) and here in Raleigh at SuzAnna's Antiques. Throw in some modern items from Pottery Barn/Crate & Barrel - BUT everything now has to be large, bold, a statement - no more tiny knick knacks which require delicate dusting!!! Funnily my latest interests come from 'down under' - the books of Australian stylist/decorator/author Sibella Court and Australian designer/decorator Debra Cronin. I love the 'collector/naturalist' items they gather together - this is why glass domes have become the thrust of my treasure hunting forays lately. My art consists of a mix - small unframed antique oils on canvas (love to see the raw edges! ), framed antique pieces of Aubusson embroidered fabrics from France, sepia-toned family photos of my lovely mother and her siblings in the 1930-40's. I stuck beautiful b/w antique French book illustrations in the panes of an old window and hung it in the dining room. In the 'office' I hung a huge world map now stuck with pins marking all the places we've visited across the globe, and framed photographs of animals I took in Africa. Mirrors, which I consider 'art' too……..lots and lots of them, some antique with foxed glass, others newer but always with quirky frames………all to make this little cottage brighter. I've now run out of walls sadly! So dear, there's MY answer to your fun question - I guess my style is definitely eclectic! This is what I enjoy, I'm not stuck in one time period or place, just a mix of things I find beautiful, fall in love with, and love to keep looking at!! P.S. OMG Nancy - Dennis is a wonderful painter - I had no idea! Love his work so much - your walls must be beautiful with such a selection of delightful paintings to hang - do you change them around? Thanks so much for sharing your talented dear man with us. Mary, you are so sweet. Thanks for coming back and leaving this very kind comment. Dennis is quite a prolific painter, so I can easily change out paintings on a whim. Of course, if someone is interested in purchasing a painting from our private collection he always asks me if I'm willing to let it go. Usually I am, but there are a few I won't part with. 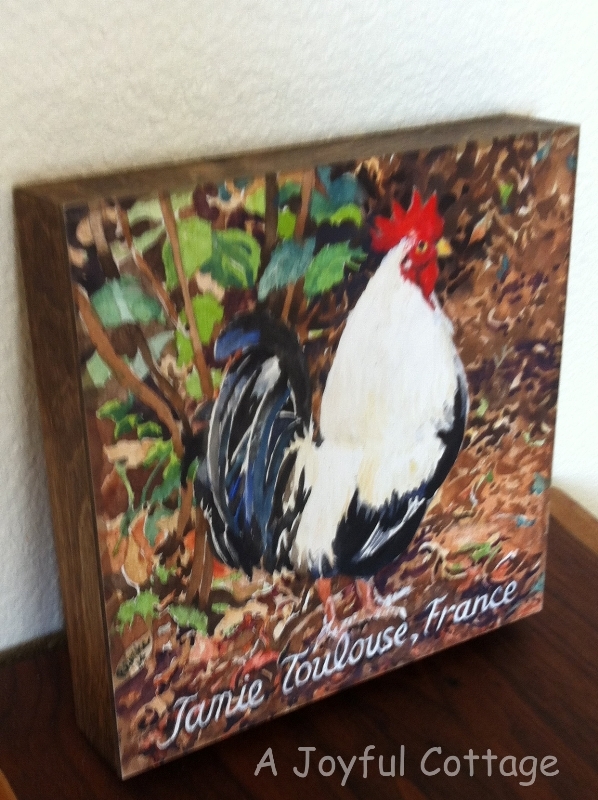 Great painting of the rooster. I enjoy all art and find something beautiful in every piece. It may be the color or the subject matter, it all meets my eye. I too love French decor. I have one room that is what I call the French room. Done in lots of black and cream with a touch of red. Your French bedroom is so inviting and charming. "Black and cream with a touch of red" sounds delightful. I'm glad you liked the rooster. It was a fun subject for Dennis to paint. Not sure if you got my email so I thought I would leave you a comment and see if this gets to you. You were one of the giveaway winners on my blog so I would need you to send me your address so I can get your gift out to you. Please just email me with your address. Thanks and congrats. I love your rooster. My daughter collects roosters and painted a rooster once. I like Swedish and French Country. I'd love to see your daughter's rooster. From the little bit I've read about her on your blog she sounds very talented. Swedish and French Country is a great look. I am your other Nancy, so of course I love my roosters! Everyone knows I do, so whenever they find an extra one laying around it seems to find its way over to my home! I have painted ones, ceramic ones, even straw ones....cookie jars....miniature ones.....big ones.....and now my husband wants me to try to paint one or two on our kitchen cabinets which we are doing French Country, of course! 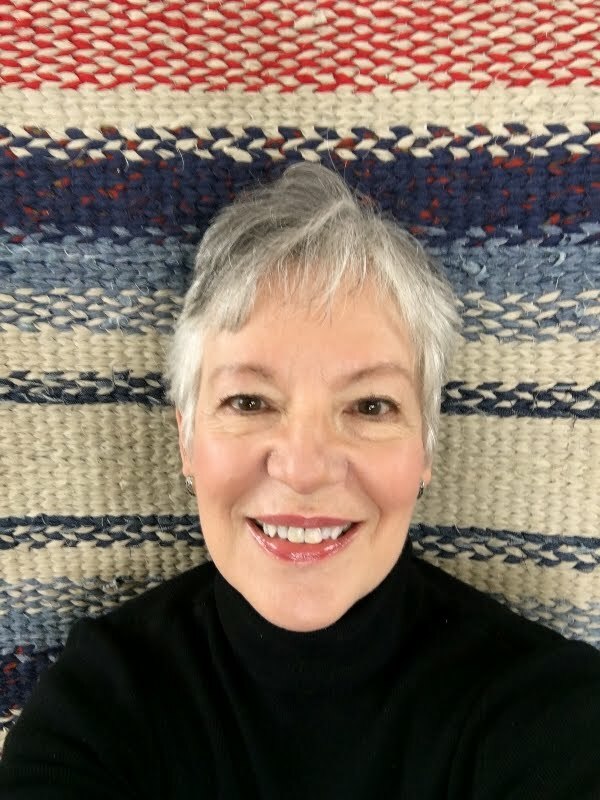 Thank you for your beautiful and inspirational blog! And peaceful blessings to all of you! Fabulous painting by your hubby Nancy! I love toile, but lately I am drawn to farmhouse style. Thanks for sharing with SYC.